FREETOWN (Reuters) - Police were guarding an Ebola treatment centre in Sierra Leone on Saturday, the day after thousands marched on the clinic following allegations by a former nurse the deadly virus was invented to conceal "cannibalistic rituals" there, a regional police chief said. Across Guinea, Liberia and Sierra Leone, at least 660 people have died from the illness, according to the World Health Organisation, placing great strain on the health systems of some of Africa's poorest countries. The virus is still spreading. A Liberian man who died in Nigeria's commercial capital, Lagos, tested positive for the virus on Friday, Nigeria's health minister said. Sierra Leone now has the highest number of cases, at 454, surpassing neighbouring Guinea where the outbreak originated in February. Angry crowds gathered on Friday outside the country's main Ebola hospital in Kenema in the West African country's remote east where dozens are receiving treatment for the virus, and threatened to burn it down and remove the patients. Residents said police fired tear gas to disperse the crowds and that a 9-year-old boy was shot in the leg by a police bullet. 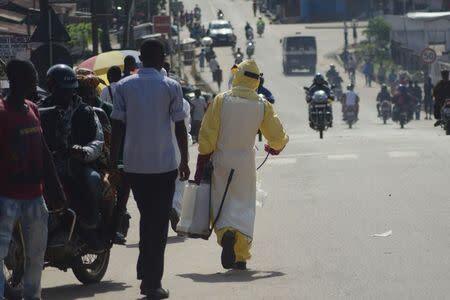 Assistant Inspector General Alfred Karrow-Kamara said on Saturday the protest was sparked by a former nurse who had told a crowd at a nearby fish market that "Ebola was unreal and a gimmick aimed at carrying out cannibalistic rituals". He said calm had been restored to Kenema on Saturday, adding that a strong armed police presence was in place around the clinic and the local police station. Some health workers from the clinic have been reported absent from work because of "misconceptions by some members of the community," according to a local doctor. Ebola can kill up to 90 percent of those who catch it, although the fatality rate of the current outbreak is around 60 percent. Highly contagious, especially in the late stages, its symptoms include vomiting and diarrhoea as well as internal and external bleeding. President Ernest Bai Koroma said on Saturday the government planned to "intensify activities and interventions in containing the disease and stopping it spread" with a view to ending the disease within 60 to 90 days. The new strategy will focus on contact tracing, surveillance, communications and social mobilization, social services, logistics and supplies, according to the president's statement. The WHO said previously that poor health infrastructure and a lack of manpower were hindering efforts to contain the outbreak in Sierra Leone. Another problem is fear and mistrust of health workers among the local population, many of whom have more faith in traditional medicine. Sierra Leone officials appealed for help on Friday to trace the first known resident in the capital with Ebola whose family forcibly removed her from a Freetown hospital after she tested positive for the deadly disease. Amadu Sisi, senior doctor at King Harman hospital, from which the patient was removed, said on Saturday she had been turned in after seeking refuge in the house of a traditional healer. She died in the ambulance on the way to another hospital, he added later. Health workers are now setting up a new Ebola treatment centre in Lakka village, about 20 km (12 miles) south of Freetown, to prepare for future cases near the capital.